Freezing rain and ice may have hurt The OneEvent’s attendance, but not its spirit. The OneEvent had roughly 1,100 youth and adults registered, but thanks to an ice storm about 200 were able to attend the event Jan. 14-15 in Salina, Kansas. The Great Plains Conference’s largest youth event featured worship, messages, breakout sessions and other activities. 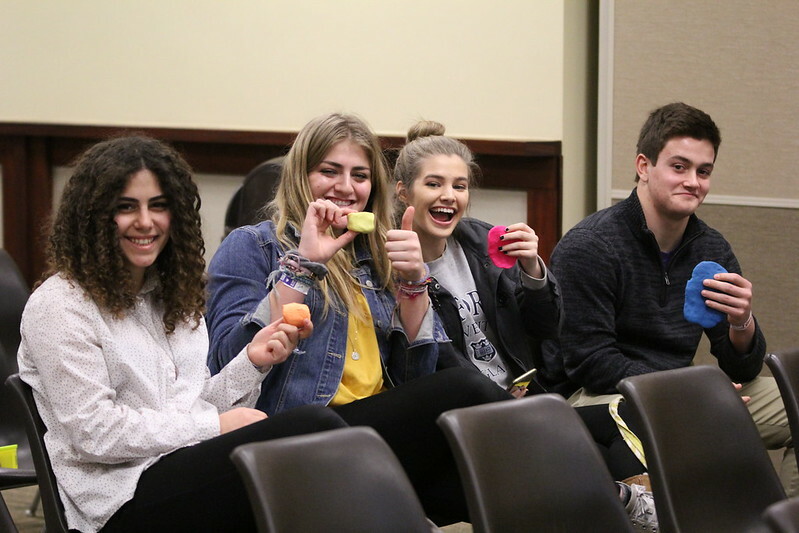 Youth from across the conference look forward to this event each year; however, many of the youth who had to travel long distances chose not to attend because of a large ice storm predicted to hit the Salina area Saturday night. And hit it did. Adjustments were made. The Saturday night schedule was shortened, three breakout topics were cancelled, and several events were livestreamed. The livestreaming helped about 80 percent of those registered who were unable to attend take part in the event in some form. General sessions, a breakout session and the comedic trio 321 Improv were all livestreamed, and some seminars were recorded to be posted on the Great Plains website. Leaders were also told ahead of time what some activities would be during general sessions so they could set it up on their end as well. For those attending, the smaller number of attendees meant better seats and less wait time to pay ga-ga ball, 9-square and go through the blowup obstacle course. The energy in the sessions and activity room was still as high as it had been in previous years. The Amp It Up Worship praise team kicked off the event followed by I Am They, a worship praise team from Carson City, Nevada. General sessions featured inspired messages from Phil and Heather Joel and comedic action by 321 Improv. The Rev. Ashlee Alley led a breakout session for juniors and seniors titled “Is it God Calling?” while Ground Zero Master’s Commission led two sessions: “Worship is Life” and “The Force Can Awaken.” After supper on Saturday, the youth — and several cabinet members — danced along to music by DJ Promote until Bishop Ruben Saenz Jr. spoke to the crowd. Let the excitement for next year start building.